4 Mc Crory Street, Armagh, BT61 7NB We are acting in the sale of the above property and have received an offer of £ 43,500 on the above property. 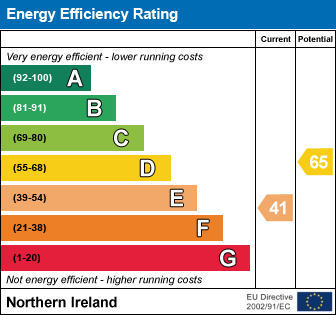 Any interested parties must submit any higher offers in writing to the selling agent before exchange of contracts takes place The Energy Performance Certificate Rating is C41 P65 Looking for a perfect investment opportunity? Take a look at this newly listed property situated in the popular Mc Crory Street in Armagh. This home is full of potential and would be an ideal first time buy or perfect for an investor looking to refurbish. Call our office for further details. 4.95 x 3.5m. Spacious room with open fire and wood flooring. 3.4 x 3.1m. Fitted high and low level units. 3.4 x 3.1m. Double bedroom. Wood flooring. 2.5 x 2.1m. Double bedroom. Wood flooring. Fitted 3 piece suite comprising of w.c, wash hand basin and bath. I am interested in 4 Mccrory Street, Armagh. Please contact me about this property.